This tutorial builds on Part 1, where you learned how to model and test a simple business network in a local version of the Hyperledger Composer Playground. In Part 2, you saw how to model an IoT GPS sensor in a shipping container by adding GPS readings to the Shipment asset, and modify the chaincode to send an alert when the Shipment reaches its destination port. Then you deployed and modified the Perishable Goods network to the IBM Cloud in the Composer Online Playground. Now, in this third and final part, you’ll install Hyperledger Fabric on your computer, and deploy the business network archive (BNA) to an instance of Hyperledger Fabric running on your machine (referred to as your local Hyperledger Fabric). You’ll install more tools and generate a Loopback-based REST interface that you can use to interact with the sample network blockchain application. Hyperledger Fabric is a framework for building blockchain applications for business purposes, and as you have already learned, Hyperledger Composer is a companion tool that makes building blockchain applications that run on Hyperledger Fabric easier. 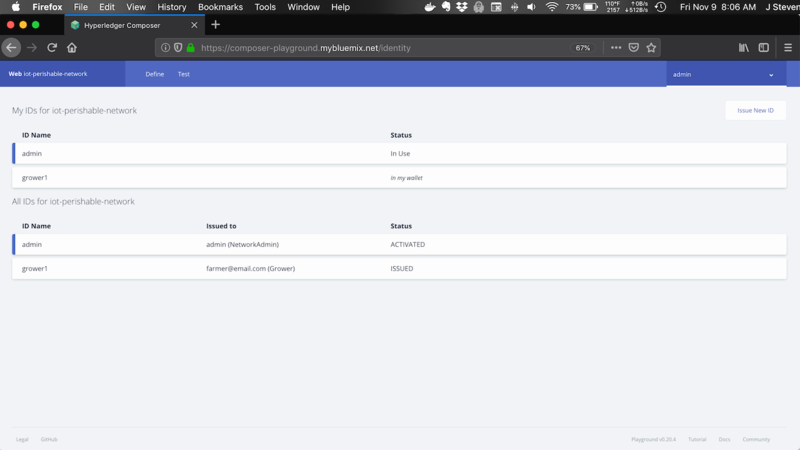 Up to now, you have used Composer Playground in “browser-only” mode (in Part 1) and the Composer Online playground in the IBM Cloud (Part 2). Now, you’ll install and run the Hyperledger Fabric on your computer, and use the Composer Command Line Interface (CLI) to interact with it. First, create a directory on your computer where you want to do your local Hyperledger Composer development. For this tutorial, I’ll refer to this location as $COMPOSER_ROOT in code, and in prose, I’ll refer to it as your Composer root directory. This directory can be anywhere you want, but I recommend you create it just off your home folder, and always set the COMPOSER_ROOT environment variable to that directory in the current shell, since that’s how I’ll refer to that location throughout this tutorial. Note: before you continue, make sure Docker is running. Make a note of the card name (PeerAdmin@hlfv1 in the output above), because you will need it to execute all of the CLI commands in this tutorial. To shut down the local Hyperledger Fabric, run the stopFabric.sh script. For the purposes of this tutorial, I suggest you leave Hyperledger Fabric up for now. In Part 2, you cloned the developerWorks project from GitHub and modified the Perishable Goods network. I’ve provided a finished version of that network in the developerWorks/iot-perishable-network directory. You’ll use that network for the rest of this tutorial. The composer network install command installs the specified network archive (dist/iot-perishable-network.bna) to the local Hyperledger Fabric, using the PeerAdmin card you created earlier when you ran the createPeerAdminCard.sh script to authenticate, and the composer network start command starts the network. These two commands, taken together, deploy the business network to the Fabric. 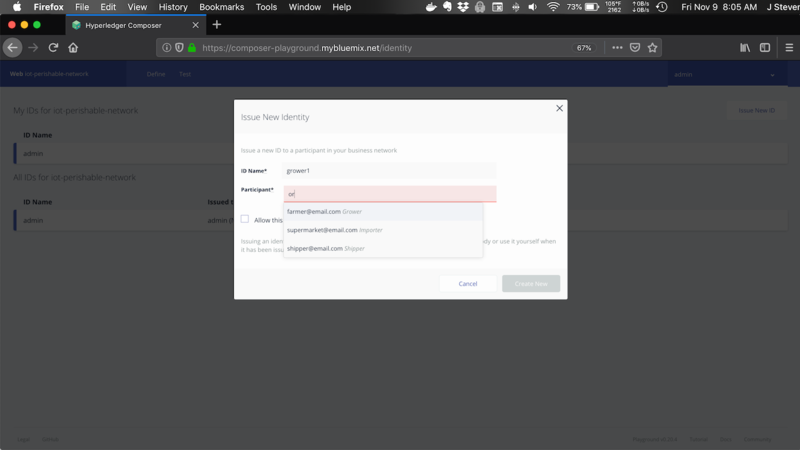 When the deployment is finished, an ID card is issued for the network administrator, whose credentials — that is, userid and password (or secret) — are stored in the networkadmin.card file. You’ve deployed the iot-perishable-network to the local Hyperledger Fabric, but how do you see what’s there? How do you interact with it? Hyperledger Composer provides a tool called composer-rest-server that generates a Loopback-based REST interface to access your network. The REST server needs to know how to authenticate with Hyperledger Fabric so it can communicate with the business network. You provide an ID card for that such as the admin@iot-perishable-network ID card from earlier in the tutorial. Namespaces help avoid name collisions. In the iot-perishable-network, this is not a big deal since there’s only a handful of assets, participants, and transactions. I think it’s a good idea to always use namespaces. Testing real-world networks with lots of participants, assets, and transactions is hard enough; using namespaces will help you avoid headaches related to name collisions. The next time you want to start the REST server with those same options, just use the command shown (line 9) and skip the interview! The interface is fairly intuitive. To work with an object, click it, and when it expands you’ll see the REST methods you can invoke (for example, /GET, /POST, and so on). To invoke the SetupDemo transaction (which instantiates the business model), click the line that contains SetupDemo, which then expands to the POST method. Click the Try it out! button to invoke the transaction. If it succeeds, you’ll see an HTTP 200 response code. Then you can navigate through the model and see the various objects like the Contract, shown in Figure 2. In the video below, I’ll show you how to use the REST interface in detail, so be sure to check that out. The administrator for your local Hyperledger Fabric is the Peer Administrator (or PeerAdmin for short), which you created when you installed the local Hyperledger Fabric. Every business network should have an administrator as well, which is created when the network is deployed by the Hyperledger Fabric administrator. Authentication for both is handled using ID Cards, which you’ll learn about next. An ID card (or card for short) is a collection of files that contains all the information necessary to allow a participant to connect to a business network. The card is referred to as an identity. Before it can be used, it must be issued to the user, allowing him or her to be authenticated and authorized to use the network. Cards are a very handy way of securing access to a Hyperledger Fabric network. Rather than keeping up with a password (called a secret in Hyperledger Composer terminology), you import the card into a collection of cards in the Hyperledger Fabric called a wallet. From that point on, you can just reference the card to authenticate that identity. The general form for specifying a card is: userid@network, where userid is the user’s unique id, and the network is the network to which the user is authenticated. To handle the two levels of Hyperledger Composer security, you need a card for at least: (1) the PeerAdmin and (2) the business network admin. The PeerAdmin card is a special ID card used to administer the local Hyperledger Fabric. In a development installation, such as the one on your computer, the PeerAdmin ID card is created when you install the local Hyperledger Fabric. The form for a PeerAdmin card for a Hyperledger Fabric v1.0 network is PeerAdmin@hlfv1. You already used this card earlier in the tutorial when you deployed the iot-perishable-network to your local Hyperledger Fabric. As a developer, you would not have access to the PeerAdmin card in a production Hyperledger Fabric installation. Instead the Hyperledger Fabric administrator would deploy your business network, create ID cards, and so on. When developing and testing blockchain networks using your local Hyperledger Fabric, you will use the PeerAdmin ID card to perform these functions. When the PeerAdmin deploys your network to the Hyperledger Fabric, an ID card is issued to the business network administrator, and then this card is used whenever the business network administrator needs to do anything with the business network, such as using the Composer Command Line Interface (which you’ll use shortly). Remember the admin@iot-perishable-network card from earlier? That was the business network admin card issued by the PeerAdmin (that is, the local Hyperledger Fabric administrator) when the iot-perishable-network was deployed. That’s right, the admin ID card can also be used to issue other ID cards for specific participants (I’ll show you how to do that later in the tutorial), so that all participants have their own ID cards. Access to the network can be controlled by these cards. Speaking of access control, Composer implements the concept of role-based security through permissions that are baked right into its architecture to handle both authentication and authorization. A participant’s access to resources is controlled based on the identity that has been issued to that participant. Access is applied to either grant or deny based on resources that match the rule. By default, if a resource matches no rule, then access to it is denied. The file is processed top-down so that the first rule that either grants or denies access to a particular resource is in effect and cannot be overridden by a subsequent rule. The format of a rule is fairly intuitive. The rule keyword indicates the start of a rule, followed by a rule name, which must be unique. The rule consists of a set of name/value pairs that define the rule’s properties. Listing 2 shows the permissions.acl file from the iot-perishable-network business network. description— a human-readable name for the rule in double quotes. Example: description: "This is a description"
participant— fully qualified name of the participant to which access is granted or denied, surrounded by double quotes. Multiple participants may be specified in the MATCH_EXPRESSION through the use of the single asterisk (*) wildcard to indicate “all”, double asterisk (**) to indicate recursion within a namespace, or ANY, which matches all participants in all namespaces. participant: "org.acme.shipping.perishable.Grower"— Apply the rule to org.acme.shipping.perishable.Grower only. participant: "org.acme.shipping.perishable. *"— Apply the rule to all participants in the org.acme.shipping.perishable namespace. participant: "org.acme.shipping. **"— Apply the rule to all participants in the org.acme.shipping namespace, and recursively any namespaces beneath it. participant: "ANY"— Apply the rule to all participants in all namespaces. operation— the MATCH_EXPRESSION may be one or more of CREATE, READ, UPDATE, DELETE, or ALL. Multiple values may be separated by commas (for example, CREATE,READ will grant both CREATE and READ access to the resource). Use ALL by itself to indicate the rule applies to all operations. operation: ALL— Apply the rule to all CRUD operations. operation: CREATE— Apply the rule only to the CREATE operation. operation: READ,UPDATE— Apply the rule to READ and UPDATE operations. resource— defines the “thing” to which the rule applies. A resource can be any class (that is, an asset, participant, or transaction) from the business model. Through the use of wildcards, multiple classes can also be specified, in the same way as for participant above. resource: "org.acme.shipping.perishable.TemperatureReading"— The rule applies only to the org.acme.shipping.perishable.TemperatureReading transaction. resource: "org.acme.shipping.perishable. *"— The rule applies to all classes in the org.acme.shipping.perishable namespace. resource: "org.acme.shipping. **"— Apply the rule to all resources in the org.acme.shipping namespace, and recursively to any namespaces beneath it. action— the action that applies when the rule fires. One of: ALLOW to grant access, or DENY to deny the specified participant(s) access to the resource(s). action: ALLOW— Allow access to the specified resource(s). action: DENY— Deny access to the specified resource(s). Note: If your network has no permissions.acl, then access is granted to all participants (that is, access is wide open — there is no resource-level security). You will see how to use rules later in the tutorial. Also, the Composer ACL documentation has lots of examples, so be sure to check that out. ID cards can be kind of abstract, and difficult to visualize. So let’s look at one in Playground (in fact, you already have, you just might not have realized it). Start the Hyperledger Composer Playground and import the iot-perishable-network (don’t forget to create the BNA by running npm install if you haven’t already). You imported a network in Part 2, so check that out if you need a refresher. Make sure to invoke the SetupDemo transaction to create the participants and store them in the participant registry. Why? Because you cannot issue an ID card for a participant that is not in the participant registry. In order to work with the classes from the business model, you must instantiate the model, and that’s what SetupDemo does for you. Please review the “Test the business network” section from Part 1 of this tutorial series if you want more information on working with business models. Once the model is instantiated, in the upper right corner where you see admin, click to expand the drop-down and select ID Registry. On the next screen, choose Issue new ID and then enter grower1 as the ID Name, and select farmer@email.com from the drop-down. See Figure 3. Click the Create New button to issue the ID. Once the grower1 ID card has been issued, it will show up in the ID registry. See Figure 4. I’ll show you how to issue ID cards using the Composer CLI later in the tutorial. I showed you how to install the Composer Command Line Interface (CLI) in Part 2, and you used it earlier in this tutorial to deploy the iot-perishable-network and import the admin@iot-perishable-network card. Now you will use the CLI to interact with the iot-perishable-network business network. The CLI is really handy because it lends itself to use in scripts, and it’s easy to use, as you’ll see. To use the CLI, you’ll need to go to the command line (Ubuntu) or open a terminal window (MacOS). Note: If you instantiated the model when working with the REST interface, don’t execute the transaction below or you will get an error message (because the model has already been instantiated). Be sure to check out the CLI documentation for a complete reference of commands, examples, and lots more. When you’re finished modifying the iot-perishable-network, you will have learned the basic skills needed to use Hyperledger Composer, you will be ready to tackle a real-world blockchain application project, you will be the envy of all your friends, and tales of your Hyperledger Composer and Fabric prowess will spread far and wide (okay, I may be embellishing a bit with those last two). If you get stuck at any point and need a little help, be sure to check out the solution code, which is in a project called iot-perishable-network-advanced that you have already cloned to your computer when you cloned the IBM-Developer project from GitHub. Note: You are welcome to use whatever editor you’re comfortable with, but I will use VSCode (which you installed in Part 2) for all the changes in this section, and the instructions below will reflect that. If you’re not using VSCode, please adapt accordingly. To make the changes listed above, you’ll start with the model. Open the models/perishable.cto model file in VSCode and make the changes below. (Note: I have omitted comments from the model snippets below only to save space in this tutorial.) If you look at iot-perishable-network-advanced, you’ll see that I have added comments for each model element I added, and I recommend that you do the same. Next, modify the Shipment asset to add four new properties for the shipment-related transactions so that when these transactions run, they are stored in the blockchain with the Shipment. Now add an abstract participant to represent an IoT device that is identified by a String property called deviceId, and add two subclasses of it: one to represent a temperature sensor, and another to represent a GPS sensor. These participants will update the blockchain with their respective readings. Devices are network participants? That’s right; a participant in a blockchain network does not have to be a human being. Finally, in a real blockchain application, events would be emitted at each important point in the workflow: when a shipment has been packed, when it has been picked up, and so forth. Add four new events to represent these points in the shipment workflow. // does the lowest temperature violate the contract? // does the highest temperature violate the contract? First, add a function to handle the ShipmentPacked transaction. When the Grower participant (or one of its authorized agents) packs the shipment for pickup and transport, it invokes the ShipmentPacked blockchain transaction to record this fact in the ledger. When this transaction is invoked, a ShipmentPackedEvent is emitted notifying any interested parties of this, and then the chaincode updates the ledger. * ShipmentPacked transaction - invoked when the Shipment is packed and ready for pickup. Next, when the Shipper participant (or one of its authorized agents) picks up the packed shipment for transport, it invokes the ShipmentPickup blockchain transaction to record this fact in the ledger. Add a function to handle the ShipmentPickup transaction called pickupShipment. 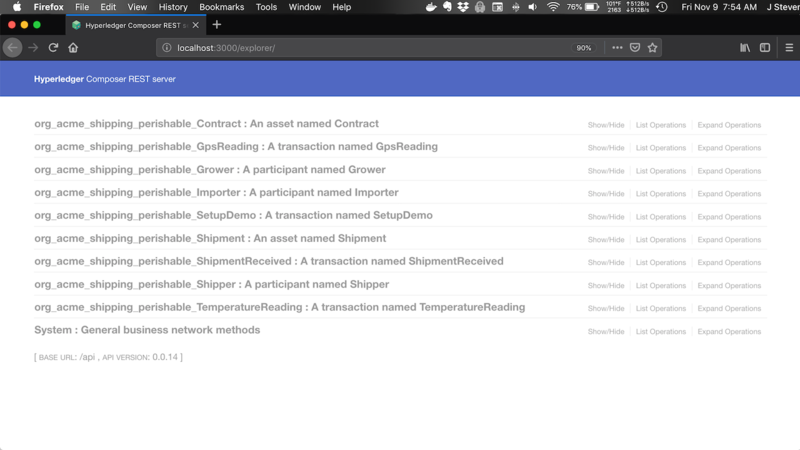 When this transaction is invoked, a ShipmentPickupEvent is emitted, notifying any interested parties of this, and then the chaincode updates the ledger. * ShipmentPickup - invoked when the Shipment has been picked up from the packer. Finally, when the Shipper participant (or one of its authorized agents) loads the shipment onto the container ship, it invokes the ShipmentLoaded blockchain transaction to record this fact in the ledger. Add a function to handle the ShipmentLoaded event called loadShipment. When this transaction is invoked, a ShipmentLoadedEvent is emitted, notifying any interested parties of this, and then the chaincode updates the ledger. 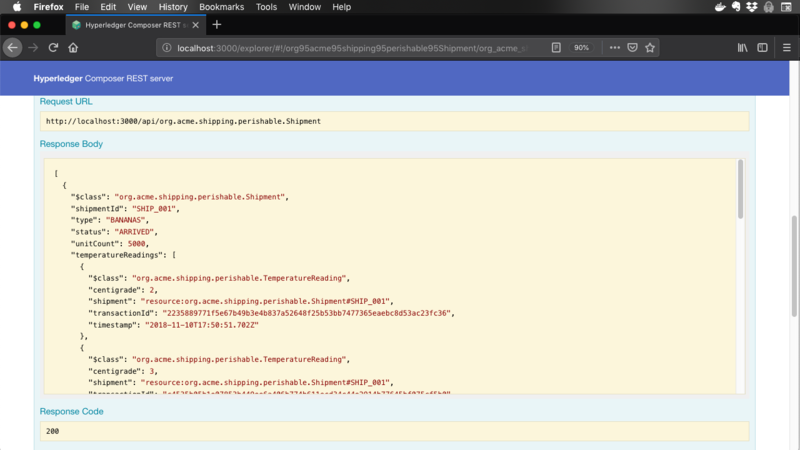 Copy all of the code below (including the function comment) and paste it into shipment.js. * ShipmentLoaded - invoked when the Shipment has been loaded onto the container ship. In a real blockchain application, it is not ideal to grant any participant permission to do anything they want to. For example, a Grower shouldn’t be able to invoke transactions that make sense only for a Shipper, and a GPS sensor shouldn’t be allowed to record temperature readings in the blockchain. So how do you prevent that from happening? In other words, how do you build your network such that you control access to its resources? Through the Access Control List (ACL) file. You’ve already seen it in Parts 1 and 2 of this series, but I just sort of glossed over it, and promised to cover it in more detail at a later point. Well, that time has come. It’s time to talk about access control, which begins with permissions.acl. You saw this file earlier, but it’s time to put that knowledge to use. You’ll modify the iot-perishable-network to ensure that resources can be accessed only by certain participants that make sense to access that resource. As an illustration, I’ve summarized the access control settings that make sense for the iot-perishable-network in Table 1. In Table 1, the type of access is provided in parentheses: R = READ, U = UPDATE, C = CREATE. The rules are codified below. Open permissions.acl (in the root of the network project), delete its current contents, and replace them with the listings that follow. The entire listing is very long, so I’ll take you through it one section at a time. The first two rules grant permission to the Hyperledger Composer system Participant and NetworkAdmin participants to access everything in the org.hyperledger.composer.system namespace, and every class in the network, respectively. Copy all of the code below and paste it into permissions.acl. The next set of rules grants permission for the participants in the iot-perishable-network to access other participants (including themselves). This access varies as it makes sense for the business functions of the network. For example, the Grower can only access the Grower class, but since the Importer executes the ShipmentReceived transaction (which updates the Importer’s and Grower’s account balances), the Importer needs READ and UPDATE access to both Importer and Grower. description: "Grant Growers access to Grower resources"
description: "Grant Shippers access to Shipper resources"
description: "Grant Importers access to Importer resources"
description: "Grant Importers access to Grower participant"
Next are the rules for access to the network’s assets. In this case, I want to grant access to the Shipment and Contract resources to all participants. description: "Grant All Participants in org.acme.shipping.perishable namespace READ/UPDATE access to Shipment assets"
description: "Grant All Participants in org.acme.shipping.perishable namespace READ/UPDATE access to Contract assets"
Next are the rules for invoking transactions (which require CREATE access). As you can see, these are on a case-by-case basis as it makes sense. For example, the Grower participant does not need to access the Shipper transactions (and vice versa). description: "Grant Growers access to invoke ShipmentPacked transaction"
description: "Grant Shippers access to invoke ShipmentPickup transaction"
description: "Grant Shippers access to invoke ShipmentLoaded transaction"
description: "Grant IoT GPS Sensor devices full access to the appropriate transactions"
description: "Grant IoT Temperature Sensor devices full access to the appropriate transactions"
description: "Grant Importers access to invoke the ShipmentReceived transaction"
The last rule says (in effect), “If there is some resource that we did not explicitly grant access to above, deny access to it.” This is currently Hyperledger Composer’s default behavior, but if that changes in a subsequent release, this rule makes sure the network behaves like this regardless of the default behavior. * Make sure all resources are locked down by default. * above this rule. Anything not explicitly specified gets locked down. description: "Deny all participants access to all resources"
That’s all for permissions.acl. Save the file, and get ready to unit test these permissions. Wait, unit test permissions? That’s right. All of the permissions in permissions.acl can be unit tested using Cucumber. I introduced you to Cucumber in Part 2, and now you’ll use Cucumber to unit test the new transaction logic and the ACL rules you added to permissions.acl in the previous section. The cool thing about Cucumber (pun intended) is that its syntax (Gherkin) is intuitive, so I don’t need to explain a lot of the tests you’re about to see. In VSCode, open iot-perishable.feature, then delete its contents and replace them with the listings below as you work through this section. First, you will set up the feature test as shown below. Notice on lines 14-16 that the test issues identities (that is, ID cards) for the specified participants. These identities will be used later in the unit test to test the security permissions you added to permissions.acl in the previous section. Copy all of the code below and paste it into iot-perishable.feature. Given I have deployed the business network definition ..
No identity, no problem You may be wondering how the Cucumber tests run if you remove the “When I use the identity xyz” (or noticed that when you do, the tests run just fine). That is because they are running as the default user, which has admin rights to your network. Keep in mind that when you’re running feature tests, you have to explicitly tell Cucumber to use a specific identity. I recommend that you always put a “default identity” in your Cucumber tests to ensure that your security permissions are always being tested. You can always override this with a subsequent “When I use the identity xyz” in a specific scenario test if you like, as you’ll see in this section. The first scenario you’ll run is when there are no temperature readings outside the agreed-upon range. Notice on line 2 that this test will be run as the identity importer1, which is an Importer. The next scenario tests the case when there is a temperature reading that is below the agreed-upon threshold. The payout amount should be less (because of the low temperature penalty in the contract). Notice that the test overrides the default identity, and is run first as sensor_temp1, which is a TemperatureSensor participant (line 2), then the current identity is switched to importer1, which is an Importer (line 6). If the test is not run this way, it will attempt to execute the TemperatureReading transaction as importer1 (which was set in the Background section), which does not have permission to invoke that transaction. Then the identity must be switched back or the ShipmentReceived transaction call will fail because a TemperatureSensor participant does not have permission to invoke that transaction. The next scenario tests the case when there is a temperature reading that is above the threshold. Like the previous scenario, this one must also be run using two separate identities. Finally, the ShipmentReceived transaction must be run as an Importer (the only participant that has permission to invoke it), and when it does an event is emitted. The identity is set for this scenario in the Background section. That’s all for iot-perishable.feature. Go ahead and save the file. The remaining feature tests work essentially the same as the ones you just saw, so I won’t bore you with a repeated explanation. 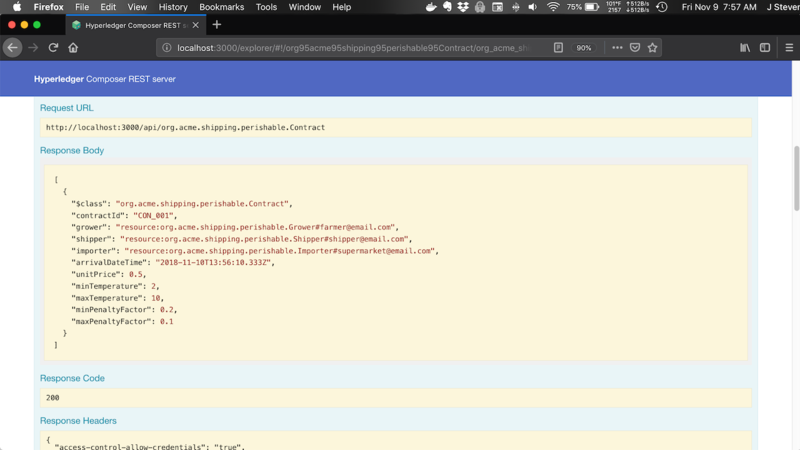 As you complete this section, just follow the directions, and paste the listings as a whole into the new .feature files. In VSCode, click on the features directory and choose New File, and call the file sensors.feature. When the file opens in the editor window, copy and paste the following listing into the new empty file. Copy all of the code below and paste it into sensors.feature. In VSCode, click the features directory, choose New File, and call the file grower.feature. When the file opens in the editor window, copy and paste the following listing into the new empty file. Copy all of the code below and paste it into grower.feature. Now save this file. Notice the default identity in use. You need to set an identity for a specific scenario only if it needs a different identity. In VSCode, click the features directory, choose New File, and call the file shipper.feature. When the file opens in the editor window, copy and paste the following listing into the new empty file. Copy all of the code below and paste it into shipper.feature. That’s it for the Cucumber feature tests. Lines 15-16 above show that the 20 scenarios (consisting of 229 steps) have all run without error. You’re now ready to deploy the network! If you’ve been following along with this tutorial, you have already deployed the iot-perishable-network to the local Hyperledger Fabric and instantiated the model. Unfortunately, you need to add TemperatureSensor and GpsSensor participants to the participant registry. You can do this through the CLI, but I want to show you how to tear down and clean up your local Hyperledger Fabric, which is something you need to do from time to time during development. When you tear down the Hyperledger Fabric using the procedure outlined below, it removes the network and any crypto materials you’ve generated so far. Now, you never want to do this in production, for obvious reasons, but this is development, so it’s something you’re going to need to know how to do. Note: For the teardownAllDocker.sh command, you’ll see a list of choices. Choose option 2 to remove all Docker images. Finally, you need to execute the SetupDemo transaction to instantiate the model, or there will be no participants for which to issue ID cards! Now it’s time to issue some IDs. You did this in Playground earlier. Now you will use the CLI to issue ID cards for the participants shown in Table 2. In the CLI section, you invoked the SetupDemo transaction, which instantiated the network. Remember, you cannot issue an ID for a participant that is not in the Participant Registry. To issue an ID card for a participant, first execute the composer identity issue command, specifying the card file, and then import the card file into the local wallet. Use the admin@iot-perishable-network card to authenticate when you execute the composer identity issue command. ID_CARD_FILE — is the file name where the ID card will be stored (see Table 2). IDENTITY — is the identity that is to be issued (see Table 2). PARTICIPANT_CLASS — is the participant class (for example, Grower). PARTICIPANT_ID — is the ID of the participant when it was instantiated in the registry (for example, farmer@email.com). Now that you’ve issued ID cards for all the participants in the network and imported those cards into your local Hyperledger Fabric wallet, you can simulate the workflow of the IoT Perishable Goods business network from the command line using the CLI. CARD_NAME — is the name of the card to use (see Table 2). Each of these transactions corresponds to a step in the workflow of moving perishable goods from the Grower to the Importer. Error: Error trying invoke business network with transaction id 410a79c15e8c87a0ecfed54deab2245ea46e69bb3335cd93b8f99bc0f29dd9f6. Error: No valid responses from any peers. The Shipper participant does not have access to the ShipmentPacked transaction, so the attempt fails, showing the permissions you coded earlier in the tutorial are working just as expected (of course, you knew that when you ran the unit test, but it’s always nice to see it in action). That was three TemperatureReading transactions, with the last one at 11C, which is 1 degree above the contract threshold, so the high temperature penalty will be in effect when the shipment is received. Now point your browser to localhost:3000, locate the Shipment asset, and execute the /Get method. You will see all of the transactions you submitted, recorded in the blockchain as part of the Shipment asset. Figure 5 shows what you should see in the response body of the /Get request. There’s quite a bit of data, so I could only show a little of it in Figure 5, but go ahead and fire up the REST server, then scroll through the Shipment asset and see the results for yourself. This tutorial covered a lot of ground. First, you installed, started, and then deployed the iot-perishable-network to a local instance of Hyperledger Fabric. Then you installed and ran the REST interface, which you can use to access the network. I hope you had a chance to watch the video, where I walk through that in more detail. If not, make sure and check that out. After that, you saw how access control works in Hyperledger Composer, including ACL rules and where they live in the network’s source code. Then you worked with the Composer Command Line Interface (CLI) to ping the running network, execute the SetupDemo and other transactions, and update the network as you make changes in development. Finally, the coup de grace: You modified the iot-perishable-network to transform it into a more real-world blockchain application, write Cucumber feature tests, issue IDs for all participants, and execute every transaction through the CLI. At this point, you should have everything you need to start developing your own blockchain applications using Hyperledger Composer. Good luck! This content was originally published on IBM developerWorks on December 14, 2017. Start blockchaining the fast, easy way in the Hyperledger Composer Playground.